Mt. Hamilton had its share of warm sunshine on Sunday. Both times I’ve been up Mt. Hamilton Road in the past month, strange things happened. First, the road was closed at Crothers. No explanation and not even an official vehicle blocking the road. 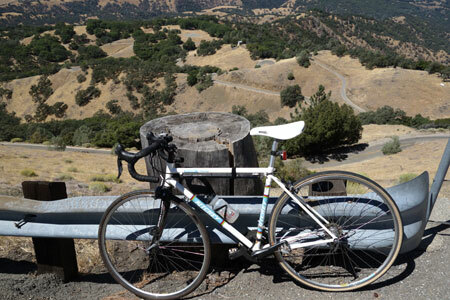 Then today I see two sheriff’s cars zooming by on the way up Mt. Hamilton following a car that was also zooming. They didn’t have lights on. Strangely, the car turned around and parked at the Grandview Restaurant and the sheriffs followed. Minutes later the sheriffs were both driving up the road and then just as quickly turned around. Weird. At the observatory I went inside at noon and took the tour to see the 36-inch refractor. Well worth the visit. 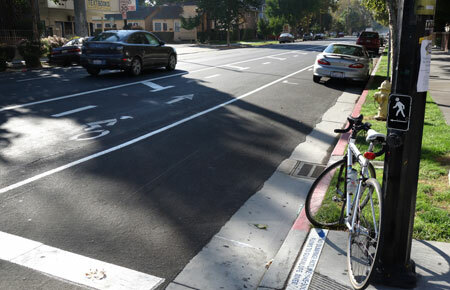 In finally saw the new bike lanes in San Jose, on 10th Street next to San Jose State. I think they’re a bit strange to look at. Here’s the new bike lanes on 10th street. A welcome addition, but I think the striping is odd. This entry was posted on September 2, 2012 at 8:16 pm and is filed under News. You can follow any responses to this entry through the RSS 2.0 feed. You can leave a response, or trackback from your own site.